Window cleaning may appear to be an easy task until you do it for yourself. It is not that easy especially when done manually. It may turn your windows dull and make your home or building appear old or less attractive. When done by qualified professionals, your windows will always be crystal clear. Fast Cleaners Bromley is a professional window cleaner in Kent with vast experience. 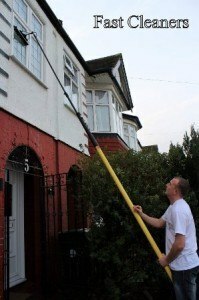 We clean all types of windows, gutters and window frames in both houses and flats. We offer our services to community at large, be it commercial, offices, private homes or residential. We use modern equipment, tools and machines, which are most effective in window cleaning. Pure water system is specifically what we apply in undertaking this task. This method is 100% natural with no chemicals at all. Thus, it is environmental friendly and a safe technique for human health. Our window cleaners are well experienced with all the necessary skills to make your windows glitter in light and darkness too. They can clean all windows in our building despite the heights involved. The system is effective and we usually come with our own highly purified water. Our washing machines have soft brushes adapted to removing all sorts of stains, even the toughest ones. We take maximum care to avoid any sort of damage that may arise and our cleaners are fully covered in case of any accident or damage. Fast Cleaners Bromley experts will always leave your windows sparkling all clean with no water droplets stains, smears or cracks. If you need more info about our window cleaning service Bromley or the cleaning prices we offer feel free to call us on 020 3322 7019.